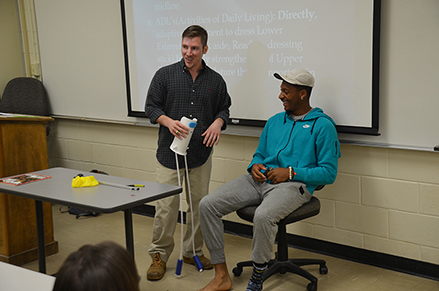 On October 23, Stewart Jackson returned to his alma mater to speak to College of Education Rehabilitation and Disability Studies undergrads about careers in Occupational Therapy. On October 23, Stewart Jackson returned to his alma mater to speak to College of Education Rehabilitation and Disability Studies undergrads about careers in Occupational Therapy. Following his graduation from Auburn, Jackson went on to earn a master’s in Occupational Therapy with top honors at UAB. He is now employed as an OT at East Alabama Medical Center in Opelika. Serving as a guest lecturer in Dr. Lee Ann Alderman’s Introduction to Rehabilitation and Disability Studies class, Jackson explained to the 40 students in attendance the practical applications of OT, how to succeed in interviews, and how rewarding it was to help patients with a wide variety of needs. Jackson also brought several “tools of the trade” and demonstrated them to the class using student volunteers.